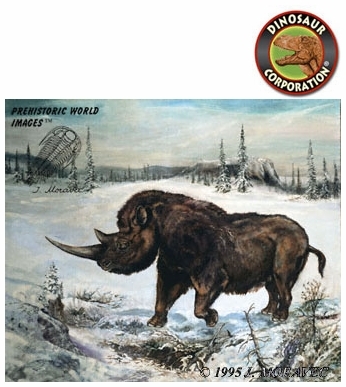 Home | DINOSAUR PAINTINGS | Woolly Rhino | Woolly Rhino, Ice Age Mammal, Picture, 8.5" x 11"
Woolly Rhino, Ice Age Mammal, Picture, 8.5" x 11"
Woolly Rhino. Coelodonta antiquitatis. Ice age mammal from Pleistocene Epoch. Original oil painting by paleo-artist Josef Moravec. The painting is in the art collection of Dinosaur Corporation. TIME - 200 - 25 TYA, Pleistocene epoch. SIZE - Up to 12ft (3.7m) long and 5.5ft (1.7m) at the shoulder. WEIGHT - Up to 1.2 US tons. Printed on Glossy paper 8.5" x 11". ▪ Woolly Rhino, Coelodonta, Ice Age Mammal, Art Picture, 13" x 19"
▪ Woolly Rhino, Ice Age Animal, Coelodonta, Framed, Picture, 17" x 14"
Woolly Rhino, Coelodonta, Ice Age Mammal, Art Picture, 13" x 19"
Woolly Rhino, Ice Age Animal, Coelodonta, Framed, Picture, 17" x 14"